Scholars In Action presents case studies that demonstrate how scholars interpret different kinds of historical evidence. 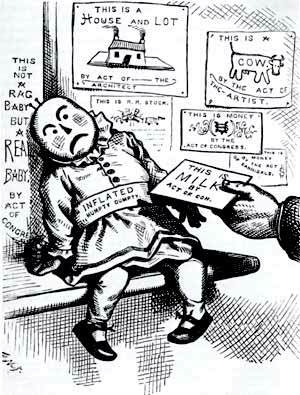 This cartoon, "Milk Tickets for Babies, in Place of Milk," created by Thomas Nast in 1876, comments on one debate that raged in the years following the Civil War: should the currency of the United States be based on gold (the "gold standard") or on paper (known as "greenbacks")? These debates about the nature of money, and the meaning of value itself, coincided with equally fundamental social and political debates about the nature of citizenship as it applied to the newly emancipated slaves. Political cartoons were a major form of commentary in late nineteenth-century American life, and Thomas Nast (1840-1902) was the most famous cartoonist of his day. Before you move to the next page examine this cartoon yourself. What do you see in it? What do you think Nast was trying to say? What elements of the cartoon confuse you? Published online July 2002. Cite as: Michael O'Malley, "Analyzing Political Cartoons," History Matters: The U.S. Survey Course on the Web, http://historymatters.gmu.edu/mse/sia/cartoon.htm, July 2002.